A mosque in a Palestinian village north of Jerusalem was attacked overnight, residents say. Two tyres were set on fire and thrown into the mosque in the village of Kasra, near the West Bank city of Nablus, 65km (40 miles) north of Jerusalem, they said. 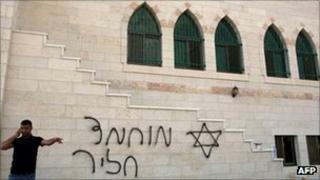 Graffiti in Hebrew threatening further attacks had been left on the walls, residents added. Israeli authorities say they are investigating. The arson attack was carried out just hours after Israeli police demolished three illegal structures at the nearby hilltop Jewish settlement of Migron. Settlers may have set fire to the mosque in retaliation, Israeli newspapers suggest. There has been sharp rise in violence involving settlers in 2011, the UN says. In 2011 alone, there have been more than 250 incidents in which Palestinians have been injured or had their property damaged. Tensions have been running high two weeks ahead of a planned appeal by the Palestinian leadership to the United Nations, calling for the acceptance of an independent Palestinian state within its 1967 borders in the West Bank, Gaza and East Jerusalem. Israel is fiercely against the move. The Israeli army has reportedly been training settlers in preparation for potential clashes with Palestinians. There are some 500,000 Jewish Settlers living in the West Bank and East Jerusalem. Settlements are regarded as illegal under international law, although Israel disputes this.